Just added scala for the first time to an existing Java project. Not too shaby. I’ve been meaning to learn Scala for at least a year. I’ve seen Scala unit tests before, and they look very cool, they’re very good at minimising boilerplate, and very easy to read and understand. At VZ, we are free to make sensible technology choices. This ranges from what libraries we use, to what databases we use, to what languages we use. Nothing is off limits, as long as we can provide a good argument as to why it’s better than the alternatives. And when we do that, our managers trust us. My product manager of course had no problems with me using Scala, we have another project here that uses Scala and he thought I meant I had done some work on that, and was interested in knowing why. After explaining that I had actually added Scala to the project I was supposed to be working on, he was completely fine, and that’s one of the things I love about working for VZ, we have the freedom to make our own decisions. For those that are not familiar with Scala, here is a quick overview of how I introduced Scala into my existing Java project. First, I did my research. What unit testing frameworks are there in Scala? You’ll quickly find that there are two popular frameworks, one called specs, and another called ScalaTest. ScalaTest supports a number of different testing styles, including TDD and BDD, while specs only supports BDD. I only wanted BDD, so both were equal to me at this point. Further research showed that specs has good integration with my favourite mocking framework, Mockito, so I went with specs. I suggest you do your own research for your own purposes, my comparison here is far from complete. Next, since I’m using Maven, I needed to add Scala to my maven project. I found a blog post that explained how to add Scala to a maven project in 4 steps, and I was able to build my project in no time. I also added a dependency on the specs library, and configured the Maven surefire plugin to run any classes ending in Test or Spec, as per the instructions for integrating with Maven and JUnit in the specs documentation. I use IntelliJ IDEA as my IDE, so I searched for a Scala plugin in my preferences, found one, installed it, and after a restart IDEA had Scala support. The IDEA instructions say that you need to install the Scala SDK, but since I was using Maven, I could just add the scala compiler as a provided maven dependency, then go to the Scala compiler preferences and point IDEA at that dependency. Finally I had to write my tests. Below is the first test that I wrote. If you’re a Scala guru, I’m sure you’ll see things that I could have done simpler or that I haven’t followed conventions for, so I’m happy for you point them out to me, I’m still learning. workResult.getMessage mustEq "Something bad happened"
Written by James Roper November 17th, 2011 at 1:40 pm. Permutations are an every day part of VZ development. Most obviously, we have three different platforms, each with different names, different base URLs, different wordings and of course different colours. But then we also have two different languages that we currently support, English and German. On top of that we often do AB testing, where we’ll have different variants of the same feature displayed or implemented in slightly different ways, and we present the different ways to different users and then gather metrics to see which ways the users seem to prefer. Finally, there are times where you have different functions, but the functions share much of their functionality. You end up with a massive list of permutations of different ways the code can be executed, too many to ever test manually, and too many to write and maintain individual tests for. The service that I’ve been spending a lot of time on at VZ is what we call the “notificator”. It is responsible for generating all the HTML emails that the platform sends, from registration emails through to new message notifications, event invites, photo comments etc. Each notification type shares a lot of its functionality with the other notification types, the emails all look very similar, and sometimes only differ by what resource keys are used to generate their wording. All keys that the templates use exist in our resource bundles. When a key doesn’t exist, text like this ends up in the email: ???new.comment.action??? 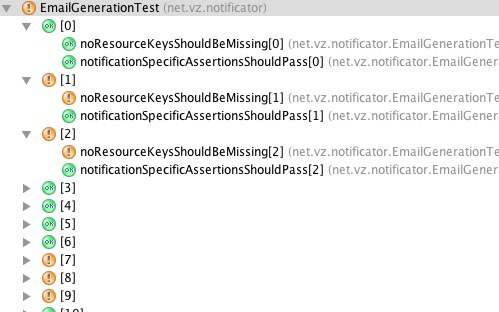 There are also many specific things for each notification type that I want to test. The requirements I have mean that I can’t just run the tests for one notification type, or for one language, or for one platform, or for one AB testing variant. I have to run the tests for every permutation of these. Writing these tests manually would be a nightmare. Fortunately, JUnit has a few features that can help us here. Sometimes these enums might already exist in some form in your code already, or you’ll have to make them up specifically for the tests. Using ones specific to your tests have the advantage that you can add meta data that is important to the tests to them, as I’ve done above with the base URLs for the platforms. Finally I can write my tests. Each test method that I write will be run once for each permutation of parameters that I have generated. You can see that I don’t get much information. Maven test runners are also similarly unhelpful. However, there is another strategy you can use to make sure you have the right information about failures. This method is quite involved, if you only have a handful of permutations, it’s certianly not worth it. In my case I have many hundreds of permutations, and so it’s invaluable. The idea is that for each configuration type, we have a custom test suite. These get nested together to form our permutations. What we can do with these is give each a name according to which configuration parameter it’s for, and so we can easily work out which permutation of configurations failed. To start off with, I’m going to write an abstract runner that simply has a name and a list of child runners. This will be the building block for my tree of runners. Note that the name of this runner is the language, it is going to be the inner most runner and the language is going to be used as the inner most list. The createTest() method is the most important to implement here, it actually instantiates the test class with the right config. testName() is also very important, it should uniquely identify the test with its config, and it’s what things like maven will display as the name of the test. 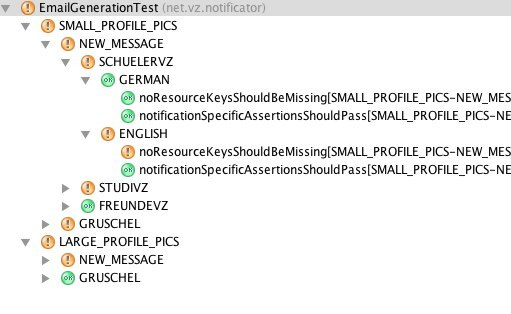 Naming it appropiately will allow you to easily see which config the test failed under. Now I’m going to write my custom runner that I will pass to the @TestRunner annototation, it will build up a tree of nested NamedParentRunner‘s. This is a fair bit more code than our initial attempt, and is also a lot of code for a single test class. But when you consider that this single test is running hundreds of sub tests that test the core functionality of my appliaction, it’s not so bad. And the results are really quite nice. This is now what it looks like in IDEA, I get a tree of permutations and can click to expand them to see what passed and what failed: So now we’ve seen some quite advanced methods for testing many permutations of configurations over the same code in JUnit. Since implementing this in notificator, I’ve been able to much more confidently make major refactorings of my templates, as well as add new notification types without having to worry about manually checking every platform, language and variant combination. I hope this will help you in the same way. You can download the above example code from GitHub. Written by James Roper November 11th, 2011 at 5:31 pm. GreenMail is a mail testing tool that has been around for a long time, but I’m surprised by how few people actually know about it. I’ve found it very useful on many occasions for testing my mail sending code, both in integration/acceptance style tests, and also in unit tests. In this post I’m going to give a short introduction to using GreenMail with JUnit, and then I’ll add a number of advanced tips that I’ve learned from my experience to help you effectively test your code. For my examples I’m going to be testing a class that I’ve written called MailSender. GreenMail starts as a server listening on ports for SMTP/POP/IMAP connections, these are naturally handled by background threads. In order to use GreenMail in unit testing, you need to start it up before each test and shut it down again after. GreenMail is incredibly fast to startup and shutdown so there’s no worries about performance of your tests here. The getReceivedMessages() method returns an array of javax.mail.internet.MimeMessage, each of which contains all the mime information from each sent email. Note that in this case, I’m assuming that everything is happening synchronously, which it is. Sometimes though (particularly in integration tests) mail is put onto a queue and sent asynchronously. GreenMail offers a handy method for dealing with this, waitForIncomingMail(), which accepts a timeout and a number of emails you want to wait for, and returns a boolean letting you know whether the mail you were waiting for arrived. throw new IllegalStateException("Could not find available port in range "
I can now specify a range of ports and my code will choose one that is free. That concludes my post on using GreenMail, if you have any other helpful tips for using GreenMail, please share them as comments here! Written by James Roper November 8th, 2011 at 11:39 am. Originally we built our automated acceptance tests within our agile development process on a continuous integration server using Selenium with only one Selenium Remote Control. The tests were executed on a fixed browser under a specific operating system. With the growth of the test cases in the test suite the execution time of the builds extended rapidly, so the tests could not directly identify defects and thus a part of their function was lost. The common strategy to solve this problem is to install Selenium Grid on the machine that formerly hosted the one Selenium RC to parallelize the execution of the tests. By connecting only 4 Selenium RC’s to this Grid Hub the execution time of these tests is reduced by a factor of 4 without any additional hardware and without rewriting the tests. The only prerequisite for this is that the used testing framework supports a parallelized test execution, i.e. it must be able to start more than one test of a test suite simultaneously and assign the answers supplied by Selenium Grid to the right test again. Although our used testing framework PHPUnit does not provide a parallel execution of tests yet we found a way to use the benefits of Selenium Grid in our testing environment. Our continuous integration server provides the possibility to set up more than one build agent to run the Selenium driven acceptance tests. If we would do this with one single Selenium RC these agents would stress this RC rapidly because there is no possibility to check its state. The agents would start new tests no matter how many tests are already running at this RC. So we installed Selenium Grid with 4 connected Remote Controls as described above. We can now control the number of simultaneously running tests, because Selenium Grid starts only so many test suites as RC’s are connected. Other incoming requests are queued in the Selenium Grid Hub until one of the connected RC’s has finished its test suite. Unlike the common usage of Selenium Grid we have not yet a real parallelization with this solution, since the test suites from the build agents of the continuous integration server run simultaneously, but each is still to be processed sequentially. But we have always the option of switching to a real parallelization when our testing framework supports it. Written by Dirk Pahl August 17th, 2009 at 8:00 am.